Astrobiology is a deeply interdisciplinary research field. What lessons on effective operation and communication might be learned from other similarly diverse fields? 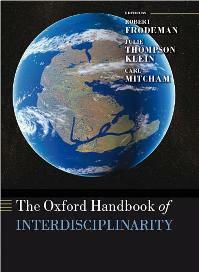 The Oxford Handbook of Interdisciplinarity is a collection of essays on a broad range of subjects, providing an extensive overview of interdisciplinarity in various research fields including physical, biological and social sciences, arts and humanities, as well as in education, environment and government. The book’s thirty-seven chapters are grouped into five broad categories, and are essentially essays on different areas of academia and societal matters. Each chapter provides an interesting introduction to, and overview of, the area of focus, from the view of interdisciplinarity, taking into account the history, development and challenges of the integration of interdisciplinarity in that particular field. Having moved from a physical sciences background to an interdisciplinary PhD myself, I particularly related to the ‘Physical sciences’, ‘Biological sciences’ and ‘A memoir of an interdisciplinary career’ chapters. The Physical sciences and Biological sciences chapters are well structured and provide case studies as examples of how interdisciplinary research has developed in the field, as well as introducing the practical and theoretical issues that have arisen with these developments. A memoir of an interdisciplinary career was especially thought provoking and encouraging for me, and has shown me that an interdisciplinary career not only holds opportunities for networking and collaboration with researchers across the disciplines, but also allows for the expansion and development of one’s own research beyond both their primary research field and the boundaries of traditional disciplines. The last section of the book focuses on transdisciplinarity in terms of merging academic research with societal needs to overcome issues relating to areas such as the environment, policy making and health services. These essays provide an engaging introduction to transdisciplinarity through information that is both interesting and relevant to current events in their respective areas. In the Law chapter Averill presents the United States as a case study for interdisciplinarity in law and clearly demonstrates the connection between law and many other disciplines such as economics and politics. Through the use of expert opinions she is able to convincingly analyse and criticise relevant aspects of the field in order to introduce the extent of interdisciplinarity within law. In conclusion, this text provides an interesting angle on inter- and transdisciplinarity in the academic and social areas considered, and is a good reference text for information on its history, development, integration and current status within these areas. The chapters are well written and can be read and referenced as individual essays, while the organisation of the book also provides a smooth overall structure. It is an excellent first edition and future editions of the text should further the interesting perspectives introduced in this book, for, as Frodeman says in the introduction to the text, “…a volume such as this will always remain a work in progress”.